Mark, also known as The Captain, spends time on the Pinckney Chain of Lakes developing new courses. He heads out to the boat with his iPhone, tape recorder, clipboard, stack of books, carafe of coffee...and a beach towel. The pontoon boat, or "floating office," is also his favorite site for a one-on-one business meeting. Mr. Sheriden, CEO of Menlo Innovations in Ann Arbor, Michigan, presented Edison and High-tech Anthropology®: The Keys to Quality at the Menlo Software Factory at the ASQ Ann Arbor section's monthly meeting. Mr. Taguchi, President of American Supplier Institute (ASI), presented Robust Engineering and Its Historical Aspects at the ASQ Ann Arbor section's monthly meeting. Mark provided training and consulting in GD&T to Imperial Automotive Industries, Ltd in Faribad, India (near New Delhi). 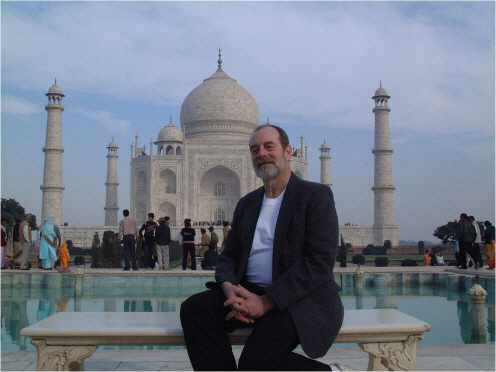 When the work was done, the company graciously sent Mark to Agra to see the amazing Taj Mahal.